Our Bottle Drop Program is doing very well! We have an account with the Redmond Recyle and have blue bags for cans and bottle collection, the bags are turned in and monies credited to our account. Bags are avaliable from Jeannette, Marlene or Kim and can be brought to the Powell Butte Jam or taken to the Redmond Recycle Center. Every bag helps and is much appreciated. 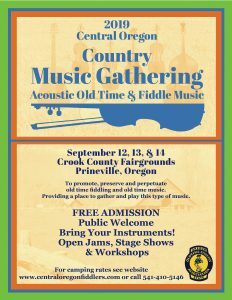 The 2019 Campground Registration form and Campground map are now available in the Country Music Gathering post also an updated Prineville Lodging and Dining lists. Please get your reservations in as soon as possible. We will also be working with local lodging facilities to try and obtain a “OOTFA” rate and rooms. We would like to acknowledge and thank our sponsors and donors for the 2018 Gathering, we hope to have them all back for 2019.Also thanks to the Crook Co Fairgrounds and the Prineville Chamber of Commerce for their ongoing support.